You can’t go a day or two without news about electric vehicles. But there’s a new one that’s been announced and it’s attempting to change what you think is possible in the pickup truck segment. 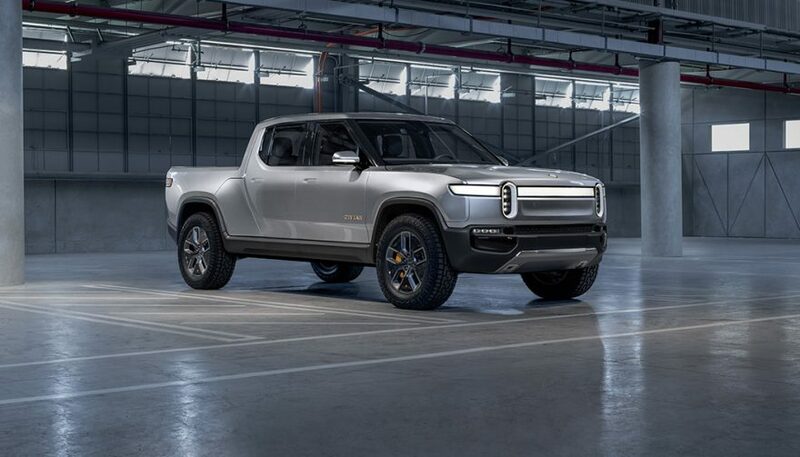 It’s called the Rivian R1T. It’s built on what they’re calling a ‘skateboard platform’ that allows for configurations you haven’t seen before. The battery pack, suspension, braking, thermal system, and drive units are all mounted below wheel height. Benefits include a low center of gravity, added stability and agility, and most importantly, a blank canvas for everything on top. On that skateboard platform, the Rivian R1T has some pretty cool features. There’s a pass-through Gear Tunnel below the cab that extends the whole width of the vehicle for things like snowboards, golf bags, and the like. The truck bed floor contains a 7.0 cubic foot watertight bin for gear or a spare tire. That’s bigger than the trunk of a Mazda MX-5. While it may or may not go into production this way, the Rivian R1T has a light bar across the front grille for daytime running lights and ‘signature stadium headlights’ and a light bar across the back for taillights and brake lights. And between the doors, the R1T goes green. Sustainably-sourced wood with a natural finish takes center stage. It’s meant to have an organic look and feel. 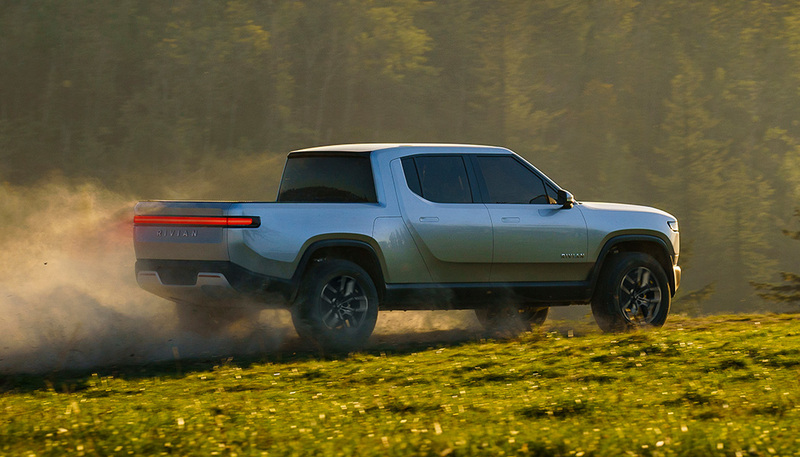 The Rivian R1T – not the most creative of names – makes claims that are bold and, if they’re true, will quickly push the popular pickup truck segment toward mainstream electrification. They’ve released preliminary specs but once again, not necessarily production-ready numbers. Four drive motors, one at each wheel, will propel the Rivian R1T. With 147kW per drive motor, the vehicle is rated for total power equivalent to 753 horsepower. Well, that’s specifically for the version with a 135kWh battery pack. The 180kWh version is slightly less at 700hp, and a late-availability 105kWh version is around 402hp. You’re probably thinking, “Those battery packs are rather large, no?” You’d be right. With Rivian’s calculations, the 180kWh R1T will have a range of more than 400 miles, the 135kWh will get 300+ miles, and the smaller pack will drive 230 miles or more on a single charge. That alone makes an electric truck a feasible option, doesn’t it? Then there’s an utterly outlandish claim, and one we hope stands up to real-world tests. The Rivian R1T’s battery is designed for fast charging and can add 200 miles of range in just 30 minutes! That’s if you can find a 160kW charger available. Along with its capabilities, the Rivian designers have incorporated tech that rivals Tesla and other top EV carmakers. The R1T connects to a cloud ecosystem with machine learning, data services, and a bunch of technical stuff that users don’t really need to know. In-vehicle tech includes a 12,3-inch digital dash, a 15.6-inch center touchscreen for infotainment, HVAC, and other controls, and a 6.8-inch touchscreen in the back too! 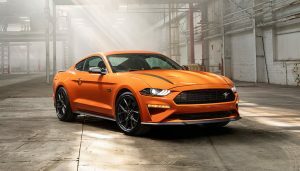 They’re building a digital experience, something that hasn’t been focused on in the truck market much. And while it’s a hot topic regarding vehicle safety, the R1T will include at launch hardware that enables Level 3 autonomous driving. Yes, the Rivian R1T is a self-driving highway vehicle. If you’re looking to get into the Rivian R1T, the wait isn’t all that long. Deliveries are expected to begin in late 2020. 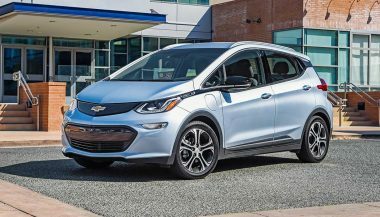 They’ll start with the 135kWh and 180kWh versions, and the 105kWh coming a year later. Rivian’s pricing starts at $61,500 after the Federal Tax Credit. 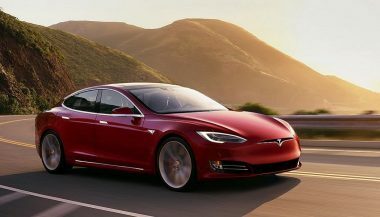 After a week that started off so nicely for Tesla, the new Model S safety rating from the IIHS could be big trouble for the electric car manufacturer. 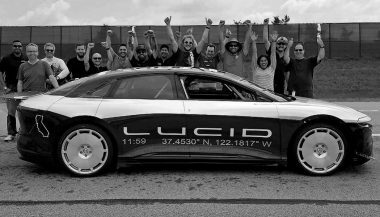 The Lucid Air prototype speed car cruised past 235 mph today at the TRC. 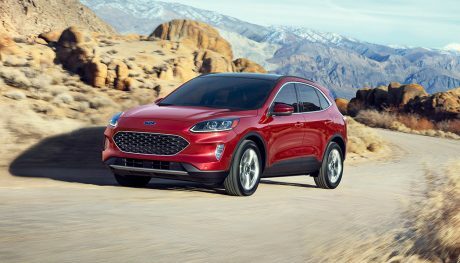 It's an impressive feat for any car, but especially an all-electric one.